Ok, Jim Carrey creeps me out. No, like, Jim Carrey I think scares me. I'm going to tell Brad that. I know literally nothing about Andy Kaufman, I should read his Wikipedia page real quick. Ok, I don't understand this bit Andy is doing. He's a foreign man, ok.
Ok, I know comedy was different 40 years ago, but this is literally not funny. Did Andy Kaufman ever get married? Miranda Sings is funnier than this. Jim Carrey is so weird. I wonder if Catt Sadler agrees. God, I hope Catt is doing well. I read on Andy Kaufman's Wikipedia page that he doesn't consider himself a comedian; just an entertainer. I agree with that. How did they make David Letterman look younger? She has the crazy memory where she can remember very specific details about everything. Wonder what she remembers about Andy Kaufman. I have never seen an episode of Taxi. So Andy Kaufman wrote in his contract that Tony Clifton also had to be cast? Was he ever in any of the episodes? Ok, I think I get Tony Danza and Scott Baio mixed up. God, Scott Baio is a perv. Ok, is Andy Kaufman weird as hell or a genius, I don't know. Can't believe Lorne Michaels is playing himself. Ok, how weird is it that on sketch shows back in the day, someone explained to the audience what the sketch was about? I still don't know if that fight on Friday's was planned or not. How the actual hell did Courtney Love get this part? I'm gonna go wash my face. Courtney Love dated Kurt Cobain. Kurt Cobain was in the 27 club. I'm 27. Am I talented enough to die at 27? That would be a funny Facebook post. Andy Kaufman was the original Jake Paul. I'm gonna tell Brad that. Ok, I get the appeal now. This is funny, like I get it. 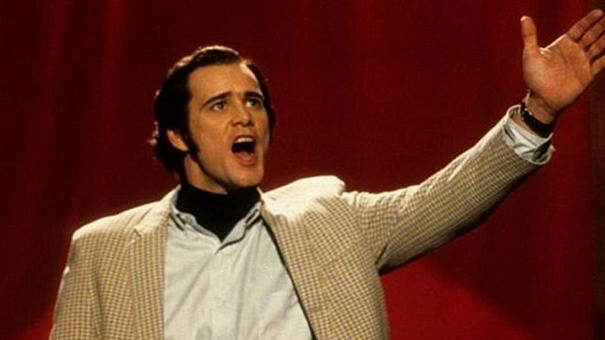 Andy Kaufman was the OG Miranda Sings. God, Miranda Sings is great. I'm gonna watch her celebrity impressions video. I should start up my satire fashion IG with Augusta again. We could be famous. I just shouted that. Brad is annoyed because the movie has barely begun. So Jim Carrey never broke character? So he also never broke character of Tony Clifton? Jim Carrey must be stopped. Ok, Jim Carrey is hot. Ok, Jim Carrey, you are literally a pain to work with and everyone hates you. Is he wearing the bag over his head because he's not in Tony Clifton makeup yet? He's kind of stealing the Tony Clifton character. Dead Andy Kaufman is not happy rn. I wonder if Andy Kaufman is really dead. That would be a good hoax. I think I get the whole wrestling thing now. Like, it was satire, wrestling women. God, if Jake Paul satirically recorded a video of a dead body, that would be funny. But it wasn't satire. I would blow my brains out if I had to be around Jim Carrey. Oh, yeah, didn't his girlfriend commit suicide? Makes sense. God, glad Jenny McCarthy got out when she did. For someone who claims he's so spiritual yet doesn't know about an afterlife? Ok, I have never seen one Jim Carrey movie except The Truman Show because my church made me watch it. Andy Kaufman had a kid? Out of wedlock? And gave her up for adoption? Oh my god, Jim Carrey sat down with the kid as Andy Kaufman so she could meet her dad. Ok, that is weird and borderline fraud. Jim Carrey is not funny. But man sometimes he's hot. Ok, I need to not ever see Jim Carrey again.